FTC disclaimer: I received a copy of this book from the publisher in exchange for a fair and honest review. All opinions are my own. This post contains affiliate links. In At the Heart of the Gospel, author Christopher West takes deep theology and makes it accessible to those of us who aren’t scholars! I appreciate his writing style as he explains things thoroughly without talking down to the readers. 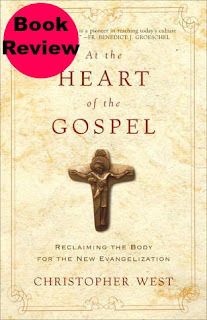 He has dedicated himself to studying Pope John Paul II’s writing “Theology of The Body” and in this book, West explains how that work relates to the New Evangelization. I’ve heard in my own theology classes in college about the Gnostics who believed the body was bad and spiritual things were good. One of the things that West points out in this book is if we believe that, then what is life without the body? It is death. This reminded me of the many times in college that I’d be in a “feminar” (a seminar for girls) and we’d be told beauty isn’t important, it’s only what is inside that counts. I realize that not everyone is a model, but beauty is in the eye of the beholder, and ask most men, and they would tell you their wife is beautiful. We can survive in a world without beauty, but that’s often what it is, survival and not thriving. One chapter I especially enjoyed was “The Narrow Gate Between Idolatry and Iconoclasm”. We can make anything into an idol be it beauty, food, other things that relate to our physical bodies, or something more abstract such as a hobby, or even veneration of saints. But do we need to go so far as to do away with things rather than keep them in check? Most likely not. If you have ever tried to lose a few pounds, to do it in a healthy manner, you still have to eat. So to have a healthy relationship with anything, it must be in moderation. I enjoyed this book, not as much as a previous book by the same author, but it’s still a good, solid book that makes Pope John Paul II’s Theology of the Body not only accessible but practical. I highly recommend this book. 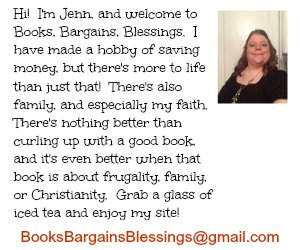 FTC disclaimer: I received a free copy of this book from the publisher in exchange for a fair and honest review. I only recommend books I enjoy.